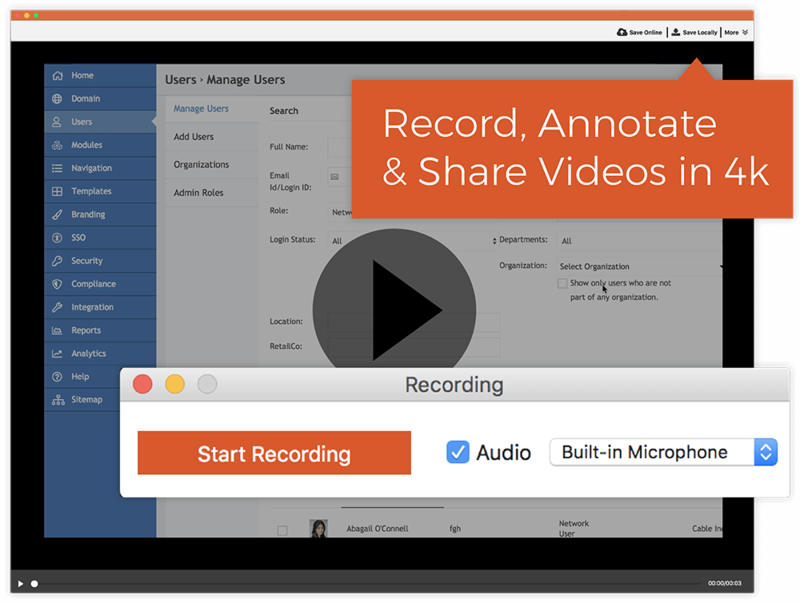 MangoApps is excited to announce the launch of our newest product TinyTake for Teams! TinyTake for Teams centers around seamlessly incorporating visual communication into the workplace, helping employees communicate faster and more effectively. It includes, of course, our most up-to-date version of TinyTake, as well as a few more highly engaging and visually based modules and features. Let’s take a quick look at everything you need to know about TinyTake for Teams. TinyTake, MangoApps’ state of the art screen capture tool, lets employees easily capture, record, and create the high-quality content their company needs. TinyTake is specifically designed to address everyday organizational needs, helping businesses collaborate effectively and improve overall office communication. With TinyTake, employees can quickly capture anything on their screen and then mark up, annotate, and explain the image with text boxes, arrows, magnification tools and much more. TinyTake can even capture content across multiple screens. Users are no longer limited to communicating with words alone and can finally show what they see. As employees are able to visually and verbally articulate their thoughts, giving feedback, sharing insights, and providing successful customer support becomes almost effortless. TinyTake isn’t limited to still images either. Users can also record their computer screens with up to 60 frames per second of high-quality video. From simple mouse movements to detailed video commentary, employees can capture information in a crisp and consistent video playing experience. TinyTake even incorporates easy to use audio abilities and includes a wide range of helpful features like multi-monitor recording, count down displays, slow-motion recording, and screen magnification. When activated, TinyTake records everything users see and do, making it the perfect tool for both internal and external communication. TinyTake video can create anything from helpful how-to videos and detailed product demos to effective customer support guides and descriptive QA reports. TinyTake even makes content management easy. Files shared or created within TinyTake are automatically stored in a comprehensive media library, where they can be tagged, named, searched for, and otherwise sorted. This ensures that TinyTake creations are well organized, and available at any time, making it easy for users to find specific files, review relevant information, and share important content with other employees. With detailed organization and sharing abilities, employees naturally improve their own communication as they are able to revisit and share existing files without having to recreate information or experiences. In addition to its namesake module, TinyTake for Teams also includes MangoApps’ premium screen sharing module. The MangoApps Screen Sharing module is an essential element of TinyTake For Teams, allowing employees to instantly share their screens with people both inside and outside of their organization. Users can share their entire desktop or just a specific portion of it, showcasing as much or as little of your screen as you need. Screen shares also include audio capabilities and can be enabled on any device, keeping communication simple and straightforward wherever you might be. Employees can even record, save, and label existing screen shares for easy future access or to share with other users. MangoApps Screen Share helps meetings happen quickly and efficiently at a distance, effectively replacing in-person meetings and saving organizations travel time, location space, and unnecessary user license fees. And screen sharing is for much more than just business meetings. 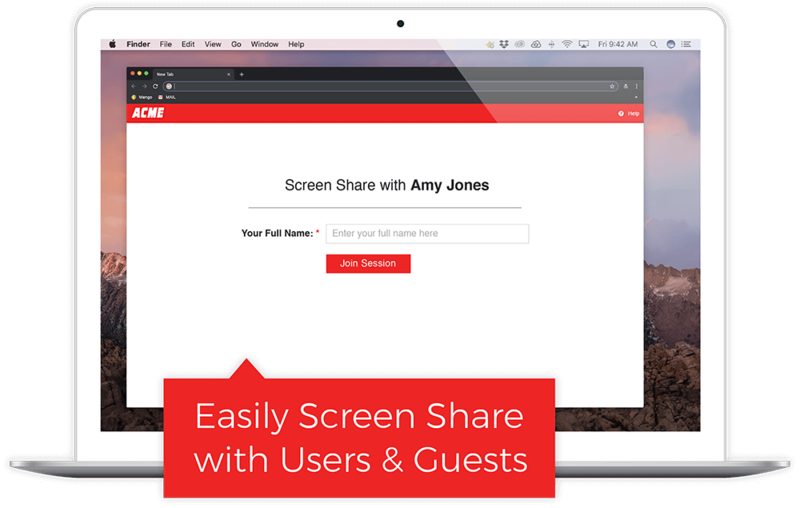 The MangoApps Screen Share module provides users with a secure access link they can share with anyone. Participants can instantly join the enabled screen share just by clicking on the link. This all-access screen share link let employees communicate easily with vendors, clients, prospective customers, and more. Screen share is the perfect tool to virtually meet up with clients and offer personalized guidance and customer support. With screen sharing, employees can collaborate with vendors about important information or company details, strengthening relationships and organizational efficiency. 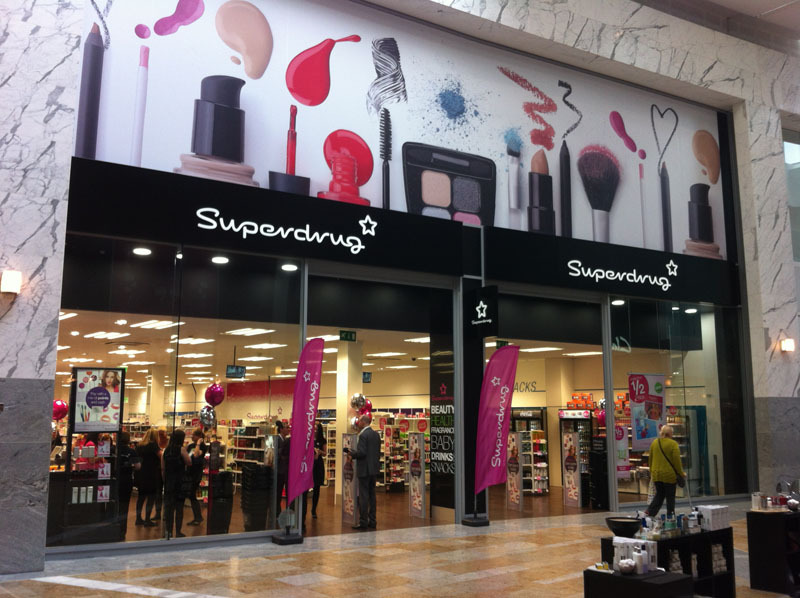 You can even improve business sales by using screen share to provide prospective customers with individually tailored product demonstrations. Last but certainly not least, TinyTake for Teams includes a comprehensive people directory. The People Directory module compiles a list of everyone within your organization, along with their individual profile image and some basic employee information (name, manager, email address, etc). Selecting the employee’s profile image will redirect you to a detailed personal profile for that person. User profiles are descriptive pages with both professional and personal information about the employee. Much of the information on a user’s personal profile like emails, phone numbers, and addresses are highly interactive, allowing you to instantly utilize the information. Personal profiles help employees get to know each other better and quickly match names to faces. The People Directory also helps everyone understand the organizational hierarchy and collaborate more effectively throughout the organization. When employees are able to visualize and personally connect with each other, interoffice and interdepartmental communication naturally increases, strengthening employee engagement, productivity, and friendship. TinyTake for Teams is built for companies and organizations at every level. From established enterprises to small startups, everyone can easily find what they need. 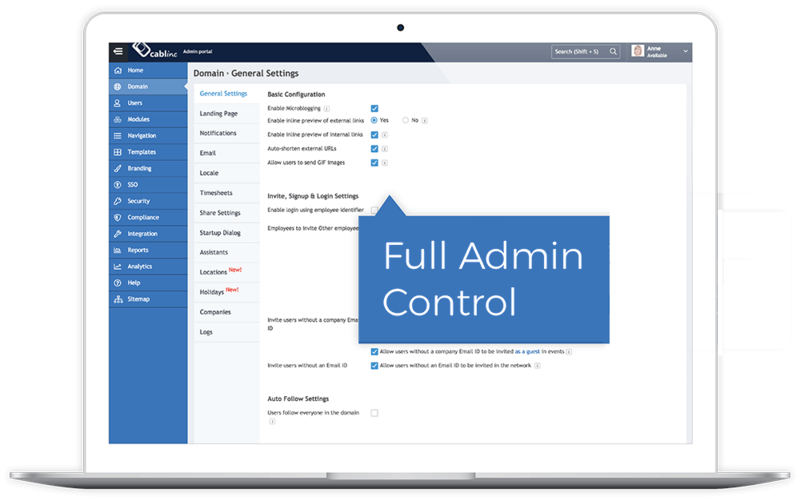 To help make TinyTake for Teams easy for company administrators, we provide admins with complete customization abilities and all of the tools they need to set up and personalize their company’s individual portal. Admins can determine everything in their company domain from branding and domain colors to the level of personalization and permissions users have. And if our out-of-the-box customization abilities still aren’t exactly right, we love working with our customers to create something completely new. TinyTake for Teams is just another example of how MangoApps is consistently listening to businesses and building exactly what they need. We don’t believe in making companies manage, pay for, or be bothered by excessive or unnecessary features. If you’re ready to embrace visual communication and increase both internal and external business success, than TinyTake for Teams is made for you. Contact us today to receive a personalized demo or to learn more about MangoApps and how we help businesses accomplish more every day.